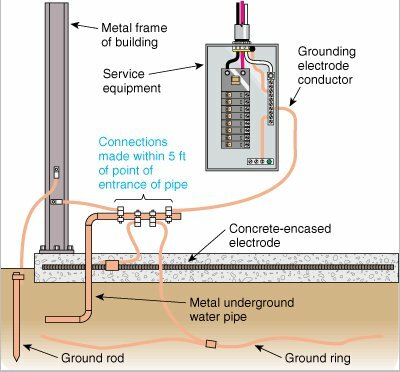 Ground rods can be connected at any point in the grounding system? Just had inspector inform me of this after seeing a very long run in a crawlspace. I went from the ground rods to the panel. He said I could of just ran a much shorter run to any metal cold water pipe or split bolt onto the main bond jumper. Never heard this and could not find in the code book. Last edited by Trick440; 02/15/12 04:03 PM. Looking thru 250, going to 250.53 (D)(2) Exception leads some to believe what you describe as being compliant. However, reading the exception, it refers to 250.52 (A)(1) exception, which states 'industrial, commercial, and institutional structures....' So based on that I will lean towards a "NO". The 'split bolt' also is a NO, as the connections should be irreversable. IMHO! But, let's see what others say! The grounding electrode conductor needs to be unspliced or spliced with a non reversible device but you can have a tap to a secondary electrode with any approved chapter 3 device as I read it. The tap conductors shall be connected to the common grounding electrode conductor by exothermic welding or with connectors listed as grounding and bonding equipment in such a manner that the common grounding electrode conductor remains without a splice or joint. If you are hitting a water pipe you need to do it within 5' of the entrance. This is for residential. Thanks for any clarification on this. As far as the ground rods being connected at any point in the grounding system, I'm wondering if it could be considered a violation to connect the rods to the #4 CU that was run to a ufer, if that #4 was meant to be used as the sole connection for it, but maybe not. The way I read it you can tap a bonding jumper onto the common GEC to a secondary electrode with any listed splicing device as long as the GEC remains unspliced. When I think of things listed for bonding I think swimming pool. What is OK for splicing that fat solid wire? There are some split bolt connectors that are listed/labeled as 'suitable for grd/bond' (my words) that are used on pool installs. They are also 'DB' and concrete encasement. Cadweld and crimp is the norm at the data centers and cell towers. Ok, so it sounds as if it is acceptable to tap off the GEC as long as the GEC remains unspliced and the connector is approved for grounding and bonding. A split bolt is not approved for this. As far as tapping off the cold water supply for the secondary ground, we would need to keep that within the 5' of entrance rule. I'm going to check with the supply house about approved connectors for this. We only carry cold water clamps, acorns, split bolts and parallel groove connectors on the truck.